Cary Joji Fukunaga’s version of Jane Eyre has that kind of sweeping yet unimposed dignity to it that you need to have if you are going to adapt a novel that is over a century-and-a-half old and one that has seen numerous filmed versions of itself produced over the years. It is a gorgeous film to look at, framed impeccably with equally good sets and costume designs. Dario Marianelli’s score fits the emotional war onscreen with matching drama. The acting is uniformly excellent, a great cast drawing from great material, adapted from Charlotte Brontë’s novel with care in Moira Buffini’s screenplay. And with these qualities, while it may not be overly original or noteworthy in the grand scheme of things, it is positively haunting and breathtaking at times, a very good movie in its own right, and deserving of a spot among notable recent adaptations of classic literature. 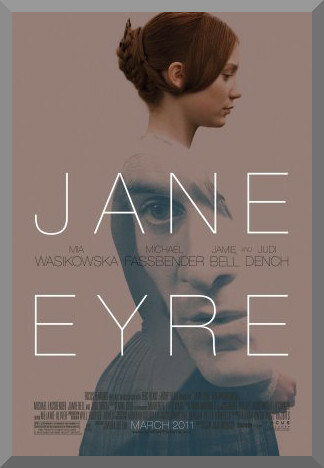 I’d assume that most people reading this are familiar with the plot of Jane Eyre, but in the case you may not be, I’ll run through it briefly: Set in England during the early nineteenth century, Jane Eyre (Mia Wasikowska as an adult, Amelia Clarkson as a child)’s parents died when she was young. She was sent to live with her aunt (Sally Hawkins), who entirely disregarded her. Jane is then moved to a harsh boarding school, where students are subjected to tyrannical punishments for the smallest of (possibly perceived) infractions, and every little thing is treated as an inexcusable affront to God by the sadistic administrators. Several years later, Jane leaves the school and finds a job as a governess for a young girl at Thornfield Hall, a large estate managed by the elderly widow Mrs. Fairfax (Judi Dench). It is here were Jane meets and falls in love with Edward Rochester (Michael Fassbender). Soon, they plan to wed, but not all things can be so simple. The story of Jane Eyre was published as a piece of social criticism, particularly one of Charlotte Brontë’s complaints with the overly obvious patriarchal society that reigned during the time of which it was published. With so much plot going on, and characters intertwining, arguing, reuniting, and nearly dying, there is plenty of room to make an unabashed (or even unintentional) freak show of melodrama. That doesn’t happen. Here, Fukunaga makes a film of understated beauty, the conflict apparent but not overblown, obvious but not garishly so. Maybe better known more recently for directing the first season of True Detective and one six minute long tracking shot within, our director leads a technical team that reflects this same core ideal – understated beauty – a.k.a. an incredibly good looking movie cast mostly in different variations of muted colors. Even the brightest outdoor scenes share the same kind of feeling. An incredible amount of unity in that respect has been assembled. Also helping this film’s case is the strength of its cast. Mia Wasikowska’s sensitive, nuanced, and complex portrayal of the title character is thoroughly riveting. She works well with her fellow cast members, especially Michael Fassbender’s externally stoic and internally vulnerable Rochester. The two create excellent levels of chemistry. A supporting cast is headed up by Judi Dench and Sally Hawkins in their aforementioned roles, and Jamie Bell as St. John Rivers, the owner of Moor House, in the book Jane’s last destination, and in the film one of the first places we see (the screenplay drums up some suspense and originality by shifting around the exact sequence of events, showing many pre-Thornfield scenes as flashbacks). Fukunaga’s production doesn’t prove itself as an overly massive or definitive event, but it’s a good time nonetheless, a decent way to spend its runtime of 120 minutes. While I’m not incredibly familiar with the source material (I know of the plot and its context, but haven’t fully read it), I imagine that this can indeed serve as an interesting discussion point for longtime students of the book, and even if you’re going into Jane Eyre completely cold, with no inkling of who anyone is or what will happen, it’s hard to leave even the least bit unaffected with the amounts of talent and craftsmanship on display in this still very much worthy movie.